Badi Pilustundi Programme Day Wise Activities 2018 – Download Mana Vooru Mana Badi Mobile App : AP Badi Pilustondi Programme Day wise Activities, Schedule and Objectives. Badi Pilustondi, Malli Badiki, Balika Utsavam Programme Schedule2018 Badi Pilustundi Day Wise Activities, Badi Pilustundi Mobile Android APP. AP School Education Department- Conduct of “Badi Pilustundi -Vidya Varostavalu” programme for the year 2018-19 from 12.06.2018 to 20.06.2018. Conduct of AP Badi Pilustondi programme and activities from 12th June to 20th June 2018 in All Schools. Badi Pilustundi Day Wise Activities Mana Vooru Mana Badi Mobile APP Rc 238 Dt.07-06-2018. Download Mana Vooru Mana Badi Android APP, User Manual and How to use Mana Vooru Mana Badi Mobile App. Students enrolled earlier during the “Mana Vooru, Mana Badi” program and during the “Badi Pilusthundi – Vidya Varotsavalu” program, may be uploaded after proper verification on to the “Mana Vooru, Mana Badi” APP, user manual & APP can be downloaded from google play store. All the Regional Joint Directors of School Education, District Educational Officers and Project Officers, SSA in the state are instructed to implement “Badi Pilustundi -Vidya Varostavalu” program during the period 12.06.2018 to 20.06.2018. This year the Badi Pilusthundi program is being undertaken in a different manner. All the DyEOs. MEOs, AMOs of SSA, Headmasters, and Teachers may make note of the same and take necessary action accordingly. The “Badi Pilusthundi - Vidya Varotsavalu” campaign will be launched formally by Sri Ganta Srinivasa Rao, Hon’ble MHRD, Govt. of Andhra Pradesh, Amaravati on reopening of schools on 12th June 2018 at ………………………. . All through the week it is proposed to take up the program in an innovative and interesting manner with children as the focus. Hence, it is instructed that during the First Week of school reopening, the “Badi Pilusthundi - Vidya Varotsavalau” program the focus should be on students who have come to the school. They should be welcomed in a special manner. Each day of the week at school activities must be taken up there are exciting, enjoyable and interesting experience to them. The day wise activities listed in the annexure should be taken up at the school level to engage the students and also to attract the children outside the school. It is requested to make it a memorable experience to the children, so that they feel motivated and excited and bring the other children from the neighbourhood to attend the school. It is believed that our well qualified, trained and motivated teachers are key to make the children come to school and in making the learning experience interesting and exciting for them. While the annexed day to day program gives a broad schedule, Headmasters and teachers may be encouraged to be innovative and creative in implementing the same. The innovative way they made the First week of the School exciting for the children and the responses from the children and the parents may be well documented and shared with all. The RJDSEs, DEOs, PO’s are requested to personally monitor the “Badi Pilustundi - Vidya Varostavalu” programme and take necessary steps for 100% participation of all the field functionaries in this programme making it a grand success. The MEOs and DyEOs may provide all the required support to the Headmasters and Teachers to make it a wonderful experience for all involved. In order to achieve the objectives of the “Badi Pilustundi -Vidya Varostavalu” programme, please ensure local public representatives and community participation and parents involvement in the day to day school level activities. Special food may be prepared and served during the MDM on each of the day. While the “Badi Pilustundi -Vidya Varostavalu” programme is scheduled from 12.06.2018 to 20.06.2018, the spirit of the first week of school may be continued throughout the year. The whole school premises and classrooms should be neatly swept & dusted/cleaned up without fail. Please ensure that the children are provided with all the entitlements like, Text Books, Uniforms, Quality Mid-Day Meal, etc. Support of the School management Committee, local community, Alumni, NGOs, Corporates, etc. may be taken to improve the infrastructure as well as quality of education. The school grants allotted under SSA and RMSA program may be utilized fully and effectively to ensure clean environment and toilets at the school. The details of the students enrolled earlier during the “Mana Vooru, Mana Badi” program and during the “Badi Pilusthundi – Vidya Varotsavalu” program, may be uploaded after proper verification on to the “Mana Vooru, Mana Badi” APP, user manual & APP can be downloaded from google play store. The suggested day wise schedule of the “Badi Pilustundi -Vidya Varostavalu” programme is appended here with for ready reference. Please ensure that the instructions reach all the schools and necessary action is taken without fail. 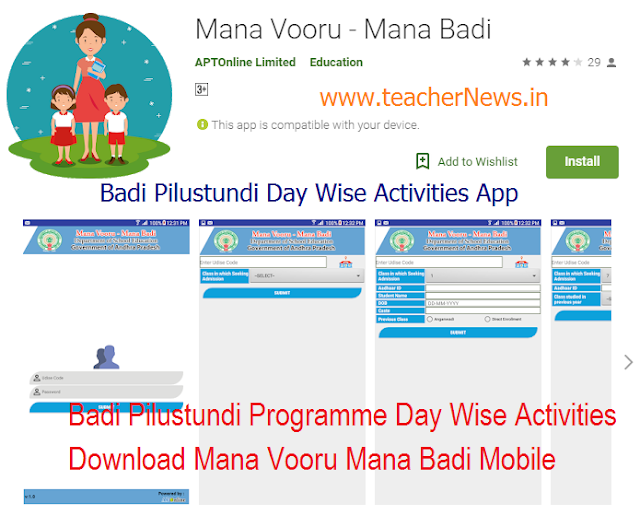 Badi Pilustundi Programme Day Wise Activities 2018 - Mana Vooru Mana Badi Mobile App Download. Mana Vooru Mana Badi Android APP, User Manual and How to use Mana Vooru Mana Badi Mobile App.